My friends, change is again afoot. Twenty-two years after the ground shifted in eastern Europe, it seems there's a similar seismic event in northern Africa. It's a little scary, and very exciting. Change has already taken place in Tunesia and Sudan, and now Egypt is poised for a shift as well. Simliar protests have arisen in Algeria, Jordan, and Yemen, with calls for protests in Syria this weekend. I don't know how this will all shake out, but my hope is for a peaceful transition to more representative government for the people of this region. It won't be quick or easy, but with many corrupt leaders having held onto power for decades (yes, often supported by my own government), it's time. Though perhaps something like the in-your-face rai-rock of Rachid Taha would be more appropriate this week, I've been listening to Egyptian jazz today. 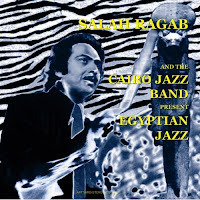 The music of Salah Ragab and the Cairo Jazz Band (recorded back in the early 1970s, re-released by Art Yard in 2006) reminds me more than a little of some of the Ethiopian jazz of the same time. It's great stuff, and I like to think that this could represent an emerging style of government for a new Egypt: some western influences layered over deeply held Egyptian roots. I've got some more contemporary Egyptian sounds, though perhaps nothing yet that has emerged alongside the current protests. But Egypt is on my mind, Jimmy, and I'll keep posting whatever I find relevant.